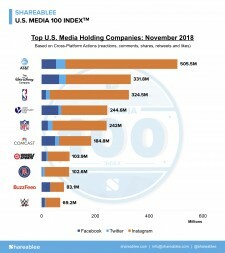 NEW YORK, December 7, 2018	(Newswire.com) - Shareablee Inc., the global leader in audience-based social media measurement, today announced that AT&T led the November 2018 U.S. Media 100 Index ranking of the most socially engaged media companies. The Shareablee U.S. Media Index was down 1.5 percent overall and represented a total of 3.6 billion cross-platform actions (post-level reactions, comments, shares, retweets and likes) for Facebook, Instagram, and Twitter last month. AT&T, driven by Warner Media, topped the ranking this November with 505.5 million cross-platform actions, followed by The Walt Disney Company (331.8 million actions), the NBA (324.5 million actions), 21st Century Fox (244.6 million actions) and the NFL (242 million actions). Of the U.S. Media 100, the NBA ramped up cross-platform content most in November, with 19 percent more posts on Facebook, 11 percent more tweets, and 14 percent more media on Instagram than in October. Buzzfeed led the video category last month with 1.5 billion views, followed by Disney’s 1.2 billion views in second, Group Nine Media’s 869 million views in third, AT&T’s 700 million views in fourth, and Oath Inc. with 634 million views in fifth. 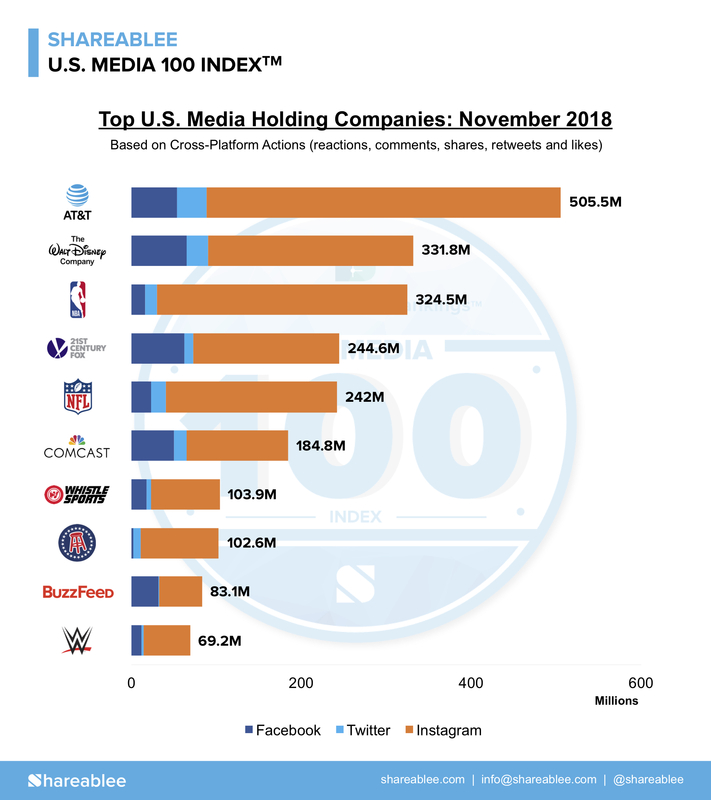 The top ten most engaged American media companies accounted for 62 percent of all actions across U.S. Media during November. Shareablee is the leader in audience-based social media measurement for media publishers, agencies and brands that want to understand the impact and effectiveness of their cross-platform social media campaigns. Launched in 2013, Shareablee empowers brands by providing data that can help them define and drive success on social media by arming them with metrics and predictive analytics that inform powerful best practices. Shareablee is the leading authority on audience intelligence, competitive benchmarking and actionable insights with clients in 15+ countries. Shareablee powers deep analytics for video and content to help brands measure, grow and monetize social media.